Cherries in bloom are a sure sign of summer. And they’re here! Michigan’s red rubies are in season. Great by themselves, in a fruit salad or atop a yogurt parfait, these succulent gems are sweet, sometimes tart and rich in antioxidants. If you’re looking to go a bit beyond the cherry basics, Eating Well has the perfect recipe for cherry almond crumble, a healthy, crispy and savory dessert that will carry you away to summertime cherry bliss. Not enough cherry goodness for you? Michigan has an abundance of cherry orchards where you can pick your own bushels. 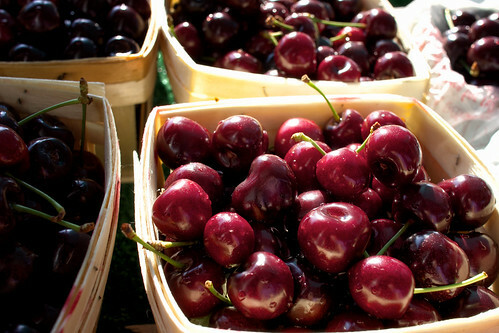 Cherry picking can make for the perfect family outing or a fun, relaxing day trip. About 75 percent of America’s tart cherry crop is grown here in Michigan. Our great state also grows about 20 percent of the nation’s sweet cherry crop. Loads of cherry-loving Michiganders will celebrate the local economy by attending the National Cherry Fest in Traverse City this July. An annual festival that revels in cherry delights, it’s a beloved event that’s lauded for its tasty cherry treats, parades, picturesque scenery and fun events schedule. Do you have a favorite cherry pastime or recipe? Share it in the comments below.